Dangerous Health Effects of Red Meat | Eat Live to Thrive! To a meat lover, there’s nothing quite like a thick, juicy, perfectly marinated, meticulously grilled steak to cause one’s taste buds to rise up in celebration. To someone that love’s the taste of steak (which, by the way, I do), the thought of each flavorful bite of a well-prepared steak is, well,… if you are a steak lover, you know what I am talking about. I was raised on steak, and lots of it. 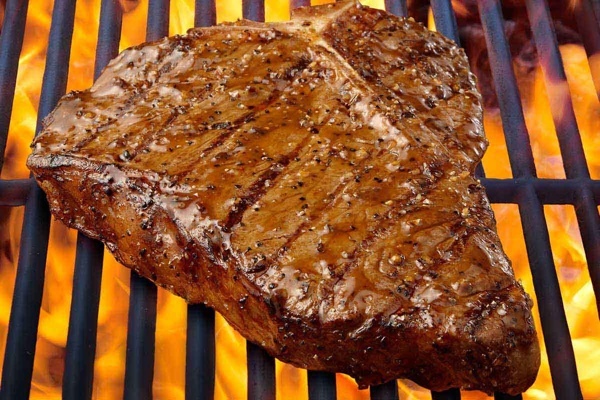 I have enjoyed eating steak for most of my adult life up until about 6 years ago (at the time of writing this article), so I do know a little about what I’m talking about when it comes to the love for steak. I also know about the dangerous health effects of red meat. The sad truth is that as delicious as steak is, it is a significant contributing factor to poor health and chronic illness that leads to expensive healthcare costs and premature death. The evidence is pretty substantial. The dangerous health effects of red meat start with the most widely known negative affect of the saturated animal fat in red meat. It is a leading contributor to heart disease and atherosclerosis. Now it is becoming public (even in main stream media) that frequent red meat eaters face twice the risk of getting colon cancer as those who do not eat red meat. Red meat is also now being blamed for increasing the risks of endometriosis and rheumatoid arthritis. I would imagine that if you are a cow, you are probably pretty happy to hear about the dangerous health effects of read meat. Unfortunately for you cows who are reading this, even in light of the dangers of red meat to one’s health, the appetite for red meat is growing worldwide. I know what you’re thinking. “What in the world am I reading this for. It’s going to ruin my love for red meat.” Speaking as someone who was the victim of a high volume red meat diet, I can tell you that as good as red meat is, getting chronically ill is not fun. In part, my high volume red meat diet and other acidic foods (animal proteins are acidic) was the leading cause of my illness. Transitioning my diet from a meat and dairy-laden diet to a high fiber and nutrient-rich diet of fresh vegetables, fruits, nuts, seeds, and whole grains made all of the difference in the world to my health. But don’t take my word for it. Check out what the American Dietetic Association says about a vegetarian diet on their website. The American Dietetic Association agrees that vegetarian diets can significantly reduce the risk of heart disease, colon cancer, osteoporosis, diabetes, kidney disease, hypertension, obesity, and other debilitating medical conditions. While red meat is a key source of protein and vitamin B12 in North American diets, nutritionists explain that properly planned meat-free diets easily provide these important nutrients while keeping you healthier in the long run. If you are ready to consider making some positive changes in your diet and reaping the benefits of a vegetarian diet, take a moment and subscribe to the Veggie Chronicles Newsletter. It will provide you with all sorts of good information that you won’t have to go digging around the internet or your local health food store to find. It will also have a way to contact me directly when you are ready to begin changing your life in positive ways by changing your diet. America’s National Institute of Health predicts that spending on all cancer treatment will rise to between $158 and $207 billion by 2020.